1 | What is an expanded noun phrase? 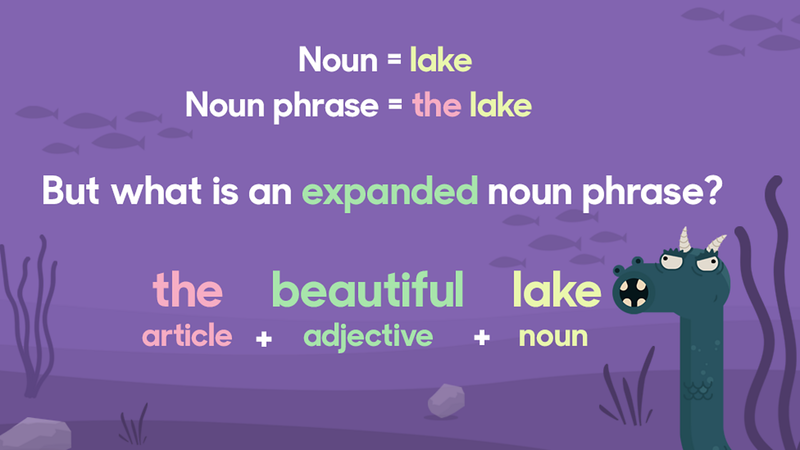 As good a place to start as any, the BBC Bitesize page for expanded noun phrases takes students through the basics of noun, noun phrase and expanded noun phrase in a clear manner before tasking them to highlight the expanded noun phrases in an example passage. This article runs through expanding noun phrases and includes three downloadable activities to try in class. There’s a PowerPoint to try expanding noun phrases as a class and then there are two printable PDF activities – one on describing dragons and one for writing about animals. Everyone loves a bit of Where’s Wally?, and giving the kids a reason to scour the detailed pages in class certainly won’t feel like work, so this idea is sure to go down a treat. The idea here is to pick someone in the picture and say “Can you find the smiling, strong man? Too hard? OK, can you find the tall, strong, smiling man with a blue hat and an axe?”. Then, as a writing activity, children come up with their own descriptions for characters in the pictures for their friends to use in order to find them. You can read about the whole idea here. Clicking on an educational song on YouTube is always a bit of a gamble. The quality can vary wildly, shall we say. So it was with great pleasure to find this punky ditty that features a bunch of good examples of expanded noun phrases that use adjectives before the nouns and prepositions after them. Watch it above, or on YouTube, here. This worksheet features a set of teaching tips and ideas to help aid the teaching of expanding sentences through the addition of noun phrases, adjectives and adverbs. There are five activities in all: ‘I went to the supermarket’, ‘Pick a card, any card’, ‘Before and after’, ‘A picture speaks a thousand words’ and ‘One word will do’. This Prezi presentation helps explain how expanded noun phrases can be used to convey complicated information concisely. It includes some short, simple activities for students, such as asking them to expand the sentence “The man opened the door” to make it into something suitable for a horror story, and changing the noun phrases “The lonely boy stumbled into the dark room” to alter its mood. One of Pearson’s free sample resources happens to be this worksheet on expanding noun phrases. It includes helpful terminology, activities and ideas for spotting expanded noun phrases in reading and and using them in writing.